The little girl who smiles out from the photograph has bright, laughing eyes. Her hair is pulled neatly into bunches and she wears a smart red cardigan and dress. 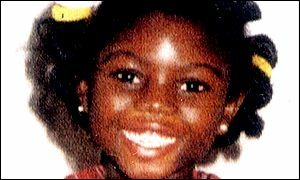 Victoria Adjo Climbie was sent to this country from the Ivory Coast in the hope of a better life, but within a year and a half of the picture being taken she was dead, the victim of horrendous physical abuse. Victoria died as the result of the neglect and the vicious beatings meted out by her great aunt, Marie Therese Kouao, and her boyfriend Carl Manning. But she was also failed by social workers and others who could have stepped in to protect her. Victoria died of hypothermia in February 2000. She had 128 injuries. The Home Office pathologist who examined her body, Doctor Nathaniel Cary, says it was the worst case of abuse he has seen in his career. "This poor little girl had scars all over her body, on the head, on the trunk, front and back, and on all four limbs. "And many of the scars suggest they'd been due to weapon-type injuries so you can see from the nature and the extent of injuries why this would be the worst case I've encountered." Victoria - called Anna by her killers - was forced to live in a freezing bath in her own excrement. Her hands and feet were bound and she was naked except for a bin liner. Manning has admitted hitting her over the head with a bicycle chain. She was also regularly beaten with weapons including a belt buckle, hammer and wire. Victoria's blood was found in the hall, bedsitting room and bathroom of the cramped flat where the three lived in Tottenham in North London. In his diary, Manning describes Victoria as Satan and says that no matter how hard he hit her she didn't cry or show signs that she was hurt. Victoria left the Ivory Coast in October 1998 to join her great aunt in France. Her parents believed this would give her the chance of a better education. In fact it is claimed that Kouao viewed the child as a useful tool for claiming benefits. The court was told that when Kouao left France for London in March of 1999 she was being pursued by the French authorities, after wrongly being paid £2,000 in child benefit. Once in England they lived in a grim hostel at Harlesden, north-west London. Kouao got a job as a hospital cleaner, leaving Victoria with a childminder. Kouao, 44. then met Manning, 28, when she got on the bus he was driving. He had never had a girlfriend. Within weeks of that meeting Kouao and Victoria moved in with him. Victoria was first taken to hospital on 14 July 1999. Avril Cameron, the daughter of the childminder caring for the little girl whilst Kouao worked, was horrified to see cuts and bruises on Victoria's hands and legs, as well as what looked like cigarette burns. The doctors who first saw her at the Central Middlesex Hospital were worried enough to alert police and social services. Victoria was placed under a 72-hour protection order preventing a furious Kouao from removing her from the hospital. But Dr Ruby Schwartz, the consultant paediatrician at the hospital, diagnosed the skin complaint scabies and Anna was allowed to return to the flat in Tottenham. Ten days later Victoria was taken to the North Middlesex hospital with severe scalding to her head. Kouao claimed the little girl had poured boiling water over herself to stop the itching caused by the scabies, but the hospital found no evidence of the disease. Doctors and nurses were extremely concerned by injuries on Victoria's body, including marks that looked like they were made by a belt buckle. Once again the system failed Victoria through what was described in court as the blinding incompetence of the people meant to protect her. Kouao and the child were seen by a social worker from Haringey Council and a police child protection officer. They decided that the injuries were probably accidental and allowed Victoria to return home. They should have visited the flat where Victoria was living before discharging her from hospital, but they were worried about catching scabies so put that off for nearly two weeks. From then on, Kouao kept Victoria away from hospitals turning instead to churches. Kouao, claiming to be Victoria's mother, said the child had demons inside her which were making her incontinent. One of the places she went was the Mission Ensemble de Christ in south London. Pastor Pascal Orome says they offered prayers for the child to cast out the devil. Now he says he understands the role that Kouao was playing. "[Victoria] was used by another force, another demonic force. It cannot be her but maybe the mother, who was using her... She doesn't behave like an eight-year-old, she behaves like a 40-year-old person." The last church that Kouao went to was the Universal Church of the Kingdom of God in north London. The child was so ill that the pastor who saw her insisted she should be taken to hospital. She died the next day - the day the church was planning to hold a service of deliverance for her, a service to cast out the devil.